Click on AT&S and then on Add. Select “Assignment” under type of assessment. Now, you are ready to add questions to your assessment. Click on Add (see circled icon below). In the Question box, type the essay question, assignment, or project (depending on the use). Answers to essay questions have no character limit. Also, there is no limit to the number of attachments that students can upload to an assignment (or essay exam), if your submission type allows submissions. There is an upload limit of 100MB per file, however. The rest of the text boxes are optional features that you may want to complete. Model Answer allows you to post an example model answer or solution. If you enter a model answer, it will be seen by students when they review how they did in their assessment, if enabled in settings. This is used in math and computer science to provide model solutions to students. You can now add points to your assignment. Click on Done, again. You will be back at the main list. You can now test drive your assignment (click on Test Drive at the menu). Test Drive helps you see exactly what your students will see when they open your assignment. If you find any errors in your assignment, return to Assessments, click on its title, click on the assignment text and edit it. When you happy with your assignment, you can set dates and publish it to make it available to students. To publish your assignment, check the box in front of it, can click on Publish at the menu. 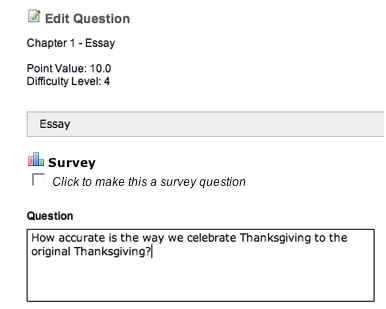 Note: When you add an assignment, test or survey under Assessments, AT&S creates a pool automatically for you and places the questions there, as well. The pool becomes a master copy of your assessment’s questions that you can reuse to create new assessments, as desired, without affecting a published assessment.